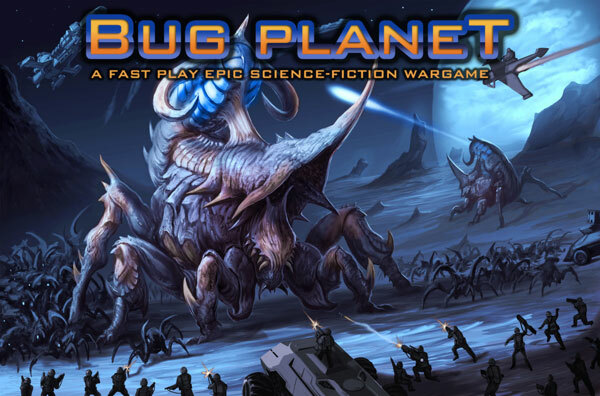 Bug Planet is a fast-playing large-scale science fiction mass battle wargame. It allow you to play epic battles with tons of science fiction miniatures, in any scale, in less than 90mins. 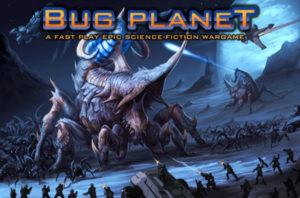 Bug Planet is designed for 2-5 players, each of whom need a pack of standard playing cards, some sci-fi miniatures and approximately ten D12 and ten D6. Inspired by the cinematic carnage of Aliens and Starship Troopers, the game is a world of hapless marines battling unending waves of hostile alien critters. Whilst less numerous and less powerful in hand-to-hand combat, the marines have both range and stealth on their side. The humans must complete their missions quickly, as the bugs have the ability to bring wave after wave of reinforcements onto the field.